Fabulous weather we've been having! After spending a couple of days on the boat (blog post pending) we decided it was a good idea to be a spectator on land rather than on the water - it was anticipated to be mayhem out there! So we went for a mid morning stroll to the Viaduct Harbour instead. Yes, it was pretty busy out there in the Waitemata Harbour. Tugboats - they are such agile vessels. This one was demonstrating its sideways manoeuvrability. 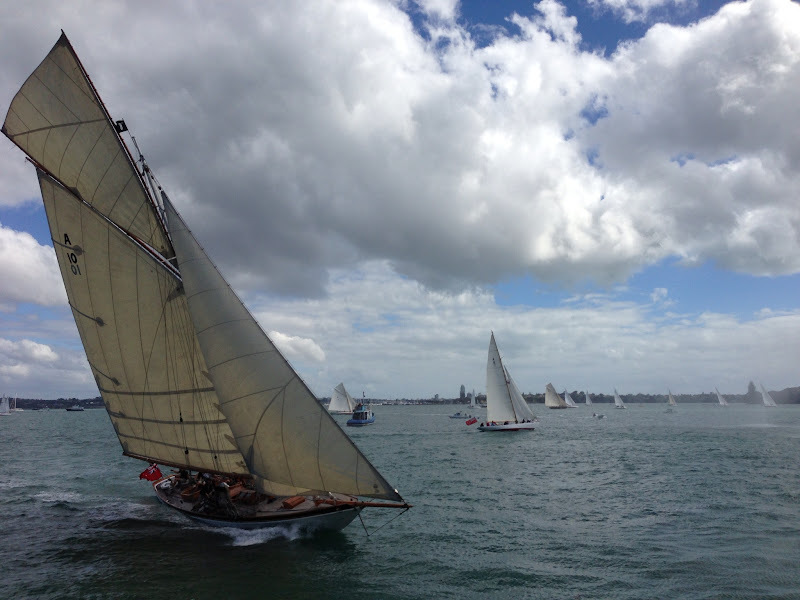 The classic yachts were out there racing, and they certainly are beautiful. Jef's friend has a classic yacht, and we were trying to spot it out there. We couldn't recognise the boat out there, but this one came up really close and got a massive cheer from the crowd. We then had a spot of lunch at Jack Tar, right next to the activities. Kien watched this guy making his puppet sing for ages. He grooved along to the music, and this would have been a perfect picture of that moment had it not been for the photobomb. 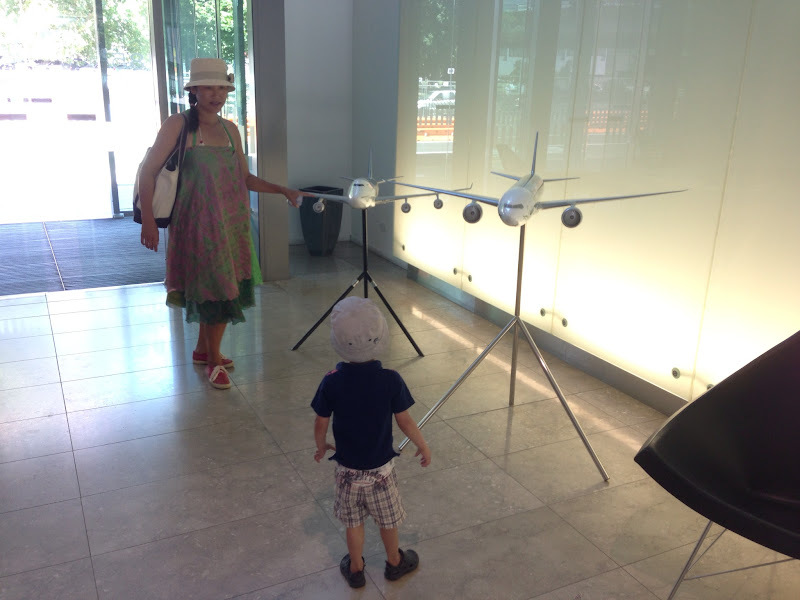 Walking back home we stopped into my work so I could show Kien the planes on display. He certainly enjoyed that. Lucky me, an extra long weekend! While most people went back to work today I headed to the beach with Rod and Grandma Gun. After a large and very filling lunch at the local Maraetai Bach'n Cafe, we went outside to enjoy the beautiful day. Kien had a great time skimming rocks with Rod. It was a perfect day for being in the water. Unfortunately none of us had togs. No matter for the boy. Goodbye Half Moon Bay marina. It's been a pleasure to be here. In some ways it's bittersweet because this place has been Cariere's home for so long, and the fact that its been our first experience being at a marina, and the fact we fell in love with this boat here, and the fact that we met her lovely ex-owners here - well, you get what I'm saying. I am so full of sentimentality. We caught the ferry over here on Saturday morning, and wandered down to the pier for the last time. The noise of the city sounds different. The hum is different. As I sat there at 23:00 on a Saturday night I could hear Green Day belting out Boulevard of Broken Dreams in the distance. I'm not unaccustomed to this hum; it feels familiar as I am used to the noise of the city. But this is certainly different to Half Moon Bay, where all you hear is...not much, actually. Half Moon Bay is a relatively quiet marina, although we always had someone watching our every move since we were directly opposite the cafes and strategically placed benches for onlookers. There is definitely a part of me that wanted to run toward the noise and dance the night away. But there is also the quieter me; the one that relishes in piece and tranquility. It was certainly quiet on the marina at dusk. Most of the other boats that were not here when we arrived were now safety nestled in their berth. We witnessed a beautifully dramatic sunset that evening. The sun had a bright orange/red glow, and as the clouds drifted across the sky the patterns and colours were spectacular. Jef and Kien floated the boat in the water. This sight is what I envisaged when we came down here to check out the pier the other week to see if we wanted to rent this marina berth. Kien running back and forth along the utility pier - his hair so wild and his smile so wide. It feels so nice to be here; just hanging out, chilling. We had our first visitors here within the first hour of arriving; Jef's friend and sailing buddy Dan, with his wife and son. They had been sailing in front of us, and we were going to meet up at Mckenzie Bay over on Rangitoto, but it was pretty rough out there on the water, and we saw them heading back before we passed the lighthouse. So they came over to say hello to us at our new marina mooring instead. It's good to have our boat here in the city. Cariere is home. Wow, I love having action packed Tuesdays, and oh boy, what a day we've had. It was a bit of a slow start in the morning when I couldn't decide our mode of transportation due to the weather. Walk or bus into town? Well we did neither as it rained every time we got up to leave. So the car it was. First stop - Albert Park for an early picnic lunch. It wasn't raining! 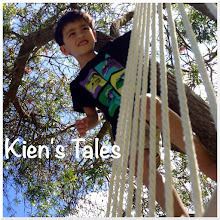 Kien tore around there, and I was hoping he would wear himself out before our next activity. He also did his strange little dance which I've never been able to catch on video. It's an awfully cute jiggle. Here is a photo Kien took with his camera (in amongst the hundreds of thumbs, feet, and ground shots). Our next stop was the Auckland Art Gallery. I had hoped to see Who Shot Rock & Roll exhibition, but I knew my time here was going to be limited with Kien being in his fine, noisy and energetic form. So we wandered around and enjoyed finding interesting nooks and crannies. 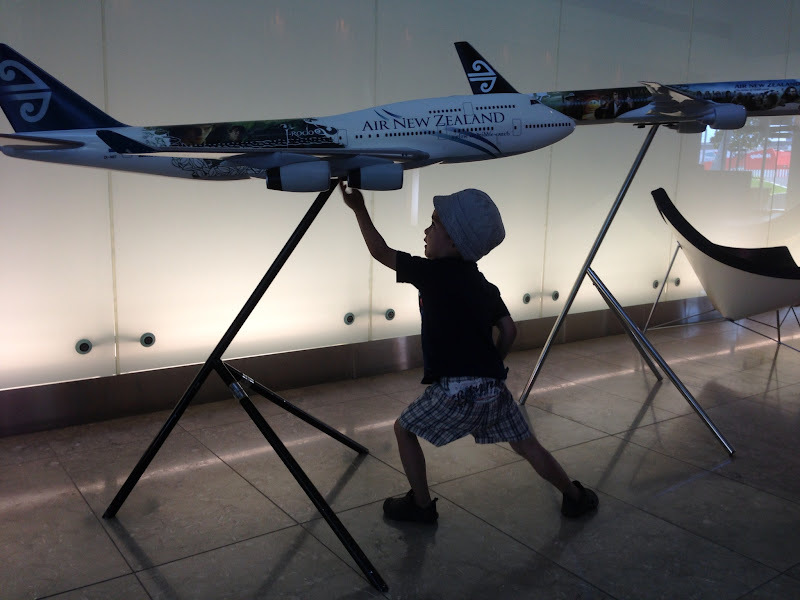 He said, "Look, Mummy. There is a drain", and when he followed it he said he was on a ladder. Last activity of the day - strawberry picking. The advantage of going to a strawberry field and picking your own is that you are also encouraged to eat as much as possible out in the field. That's right, the woman actually told us to make sure we fill our bellies up before coming in to weigh the bucket. Kien loves strawberries (as do I); fruit so succulent and inviting to be eaten. I love seeing rows upon rows of these beautiful plants. Strawberry fields, forever - too right, Paul.